This is the project that I have been the most excited about since I started thinking about Leah’s big girl room. 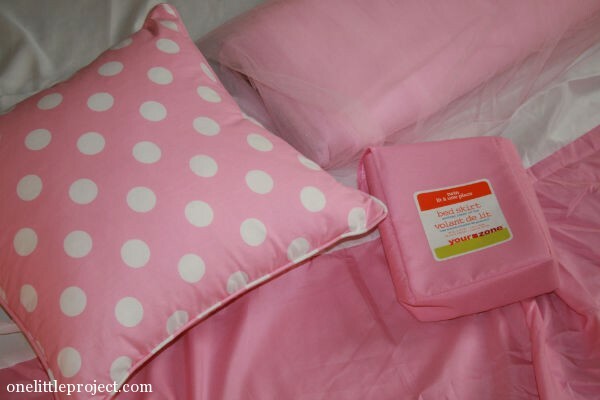 I am not a girly girl who likes everything pink. 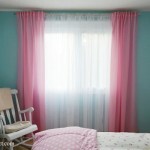 This bedroom is an interesting challenge, because Leah LOVES pink. I hit the pre-Christmas sales when I bought the supplies for this one, so it has been sitting in the closet, ready to go, for awhile now. I decided that yesterday was the day I’d start, and I was psyched to put it together. 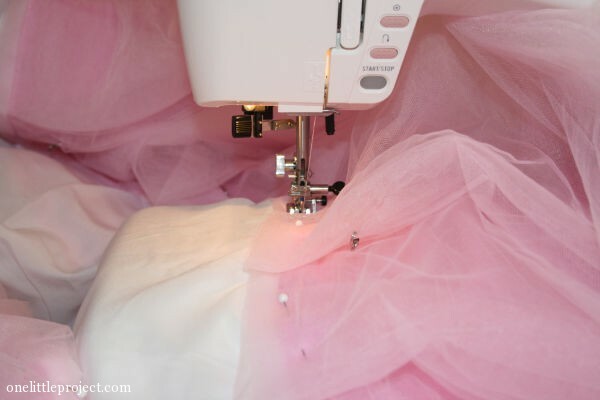 Until I realized two things: 1) I had no idea how I was going to make it, and 2) tulle is an enormous pain in the neck to work with! I spent hours pinning it yesterday. Seriously… HOURS. 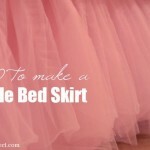 I think I figured it all out now, so I’ll be posting the tutorial for how to make a tulle bedskirt soon. 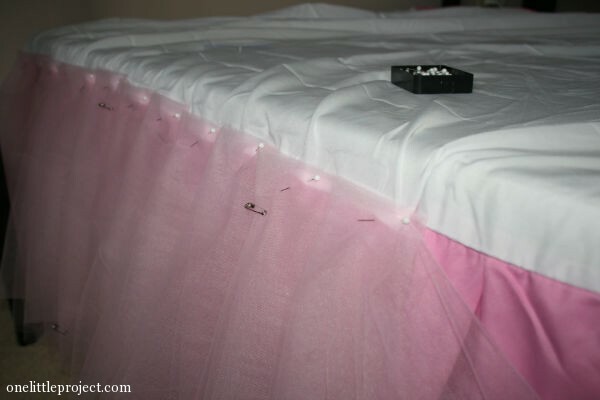 It already looks like Leah’s bed belongs at a wedding… I love it! 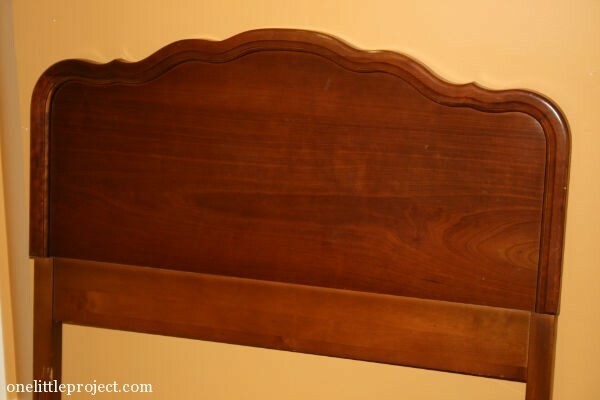 I was also super excited to refinish Leah’s headboard – it’s one of the things I was talking about in yesterday’s post that I plan to paint to match the IKEA dresser. I picked it up for $15 on Kijiji and I was ready to get started, but I ran into a bit of a snag: I bought it from smokers and it stinks! I probably wouldn’t have bought it if I had remembered to ask the sellers if they were smokers, but I had already driven all the way across town, and I figured for $15 I could figure out how to fix it. I read online that vinegar can help get rid of the smell of cigarette smoke, so I scrubbed it down with a brush and a solution of equal parts water and vinegar, but it still smells. I’m not sure what to do with it to get rid of the smell? I’m pretty sure the paint will cover it up, but I think I should try a few more things, just in case? That project is going to be slow until I figure out what to do. Today we had the painter over and he said he can paint Leah’s and Kate’s rooms early next week! I don’t have a problem with painting by myself, but I am really slow. Their rooms would be out of commission for days if I did it myself – which is just not an option for us. So this is a little luxury while I get someone else to do the hard work. Two rooms, two different paint colours, and only a few days to decide. 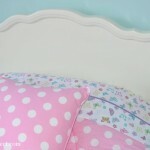 You might be seeing some posts about Kate’s nursery coming up!